Ford's Thai-Tang: Stockpiling parts is an option. DETROIT -- Ford Motor Co. is asking Tier 1 suppliers to make backup production plans for key plants that could disrupt Ford's vehicle assembly if they shut down. 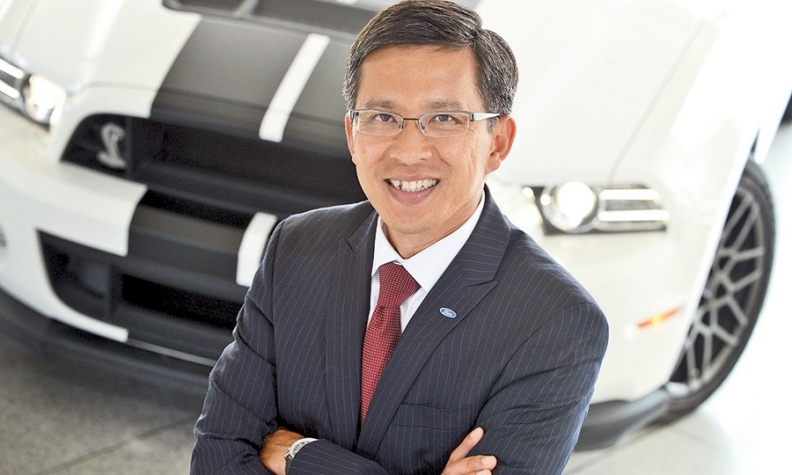 Suppliers can adopt a variety of strategies to ensure a smooth flow of parts, Ford purchasing chief Hau Thai-Tang said. If a plant is crippled by fire, flood or labor strife, some suppliers might certify a plant in another region for emergency production. Or if that part isn't produced anywhere else, a supplier might maintain an inventory in a warehouse. That's unusual but not unprecedented, Thai-Tang said. "If we can reroute parts from another region, that's great," Thai-Tang said in an Oct. 3 interview. "But if the lead time [to transfer production] is really long, and the [potential] loss is very high, it may be worthwhile to stockpile some parts." In fact, Ford asked one supplier to maintain an inventory of door trim for a regional variant of a vehicle because the automaker feared a possible labor disruption. Thai-Tang did not identify the supplier. Ford is focusing its risk management primarily on its 150 largest suppliers, which account for 80 percent of the company's annual direct purchasing budget. Other automakers are taking a similar approach to disaster planning. Toyota Motor Corp., for instance, has asked 400 North American suppliers to identify any key parts that were produced by just one factory. Those suppliers were told to develop plans to transfer production to another plant in case of fire, flood, earthquake or other mishaps. Likewise, Chrysler Group has plans in place to ensure a reliable flow of components, said company spokeswoman Katie Hepler. "There are a variety of levers that we can pull to ensure continuity of supply," Hepler said last week. "It's something that we're mindful of, and we are dealing with that daily." Ford's plan took shape after the 2011 earthquake and tsunami in Japan crippled dozens of key suppliers, disrupting global auto production for months. The disaster forced Ford to rethink its emergency planning "because natural disasters are 'black swan' events -- they are not predictable," Thai-Tang said. Like other automakers, the company considered taking a census of its Tier 2, Tier 3 and Tier 4 suppliers to identify potential bottlenecks. But a census has limited value. Even if Ford had a complete list of suppliers down to Tier 5 or 6, it still wouldn't know which plants were potential bottlenecks. For example, a Merck plant in northern Japan supplied an aluminum-flaked paint pigment to a number of companies. After the tsunami shut that plant in 2011, the automakers discovered that the paint was unavailable anywhere else. The auto industry encountered another bottleneck in 2012 when an explosion wrecked Evonik Industries' nylon factory in Marl, Germany. Ford and other automakers, to their chagrin, learned that the Evonik plant supplied most of them with nylon 12, which is used for fuel and brake lines. A mad scramble ensued as they searched for a suitable alternative to nylon 12. A supplier census would not have identified the potential Evonik bottleneck, Thai-Tang said. So instead of taking a census, Ford has asked its Tier 1 suppliers to make disaster plans for key plants. Thai-Tang also has asked those suppliers to instruct their suppliers to make disaster plans. He said that effort is underway.